Brent Nolasco's new "Over Saturated & Under Appreciated" project will debut at the Tenacious Toys booth (#2878) at the 2010 New York Comic-Con, October 8-10. 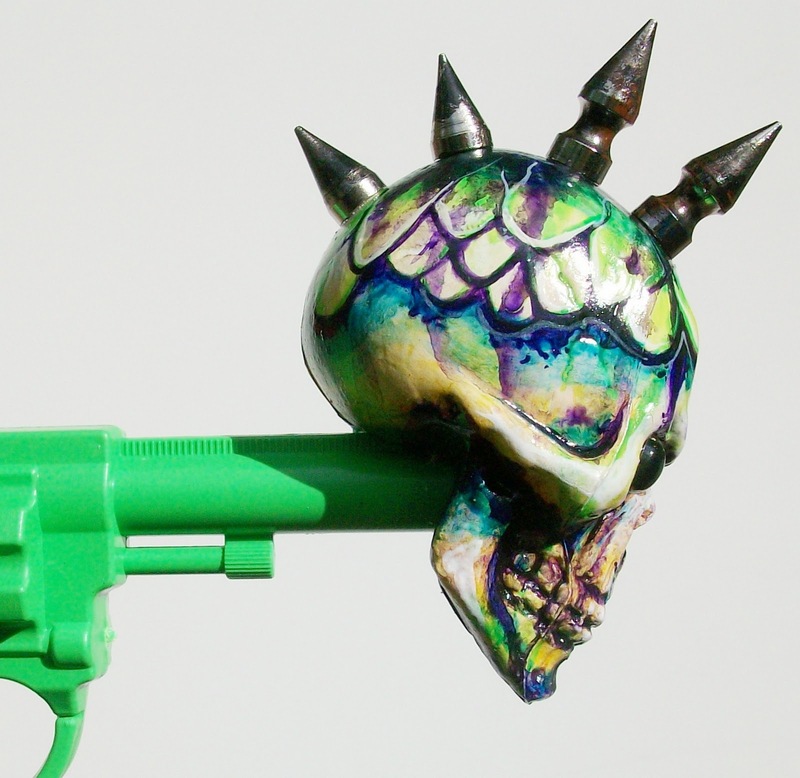 Brent Nolasco's newest line of artworks is called "Over Saturated & Under Appreciated". 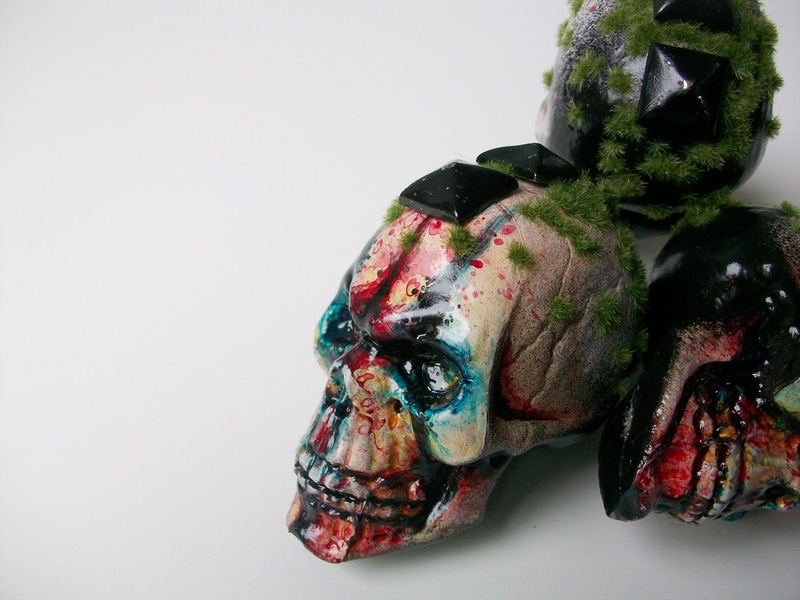 The project uses mass-produced found objects as a basis for Brent's off-kilter art. 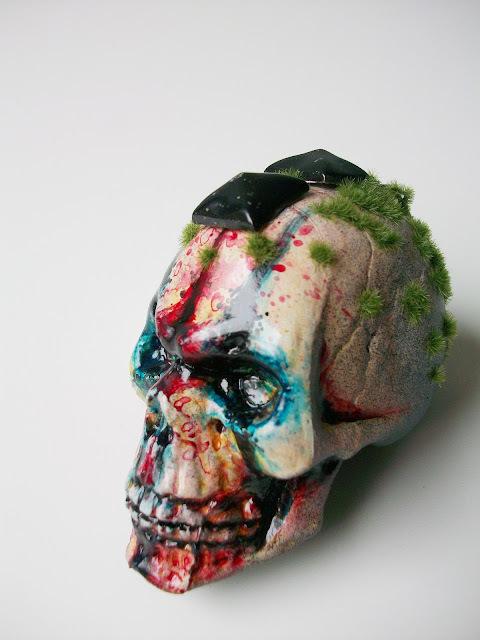 Brent has wanted to do this project for a long time, and recently acquired some skulls mass-produced by Martha Stewart, giving him the perfect starting point. This new direction gives Brent the opportunity to put his spin on pop culture icons and symbols. The beginnings of this project- the skulls- will be for sale at the Tenacious Toys NYCC booth #2878 in The Cultyard. A follow-up piece incorporating a gun and a skull will also be on display. 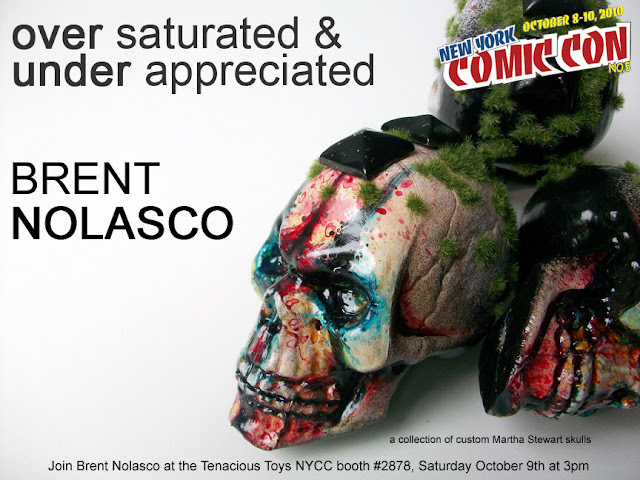 Brent Nolasco will be signing at the Tenacious Toys booth at 3pm on Saturday October 9th. 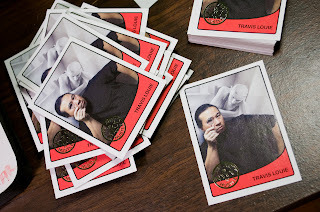 #1: Travis Louie NYCC Exclusive Art Hustle foil-stamped card, made especially for us, especially for NYCC 2010, by the fine folks at Sidekick Lab. FREE with the purchase of a $3.50 Art Hustle card pack at our booth! Only 180 made. #2: Rampage Toys Kaiju Cupcake resin figure, plus accompanying print. $100, only 5 made! #3: Lemi the Space Wanderer mini plush set: three 5-inch handmade mini Lemi plushes in a zippered Lemi bag, with a sticker and a magnet. 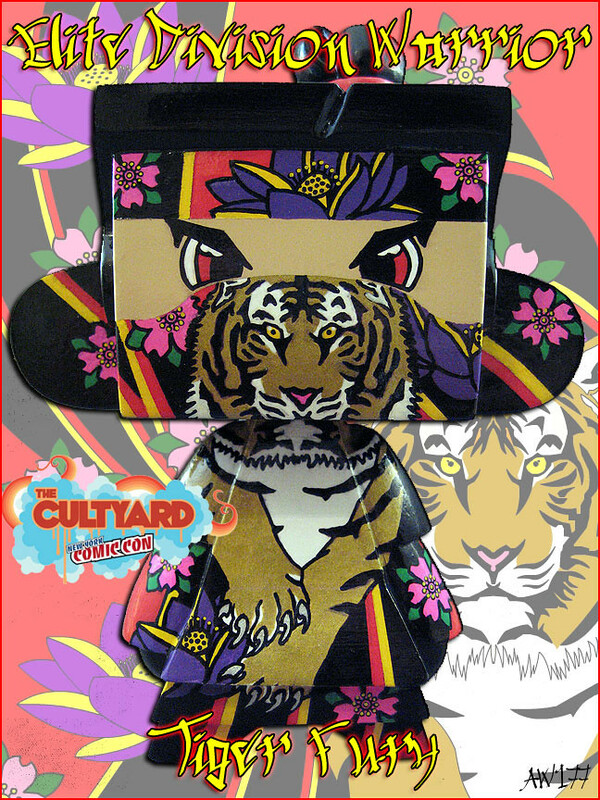 $25, made by Thunderpanda in Indonesia in very limited quantities. Wizard Sleeve Toys is sponsoring an AWESOME giveaway at our NYCC booth: six (6) of their SKET Bacon MadLs in the rare Glow-in-the-Dark Purple variant colorway! 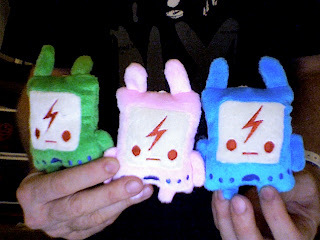 We are giving away 2 of these rare figures per day, at 4:30pm each day. Here's how it'll work: show up at our booth early. The first 30 paying customers each day will get a card with a number on it. At 4:30pm, those 30 people should come back to our booth. We will use a Random Number Generator to give us 2 random numbers between 1 and 30. The people holding those cards will win! 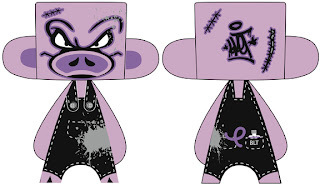 Total of 6 GID Purple Bacon MadLs will be given away at our booth over the course of the NYCC. Must be present at the time of the drawing to win. **UPDATE** For those of you who cannot make it to NYCC, we have arranged a simultaneous contest on Toys R Evil so that everyone, all around the world, will have the opportunity to win a GID Purple Bacon MadL! Stay tuned to TRE for more info on that. We'll also be giving away some Ccino the Sad Coffee Cup stickers! Look for those on our table. We will be showcasing (and taking preorders for) a bunch of Toy2R products that have not yet been released. We are very happy to have a positive relationship with Toy2R, and as such, we will have upcoming Toy2R products displayed in our booth that no one else will have! We have a LOT going on this year at our NYCC booth, which is #2878 in The Cultyard. 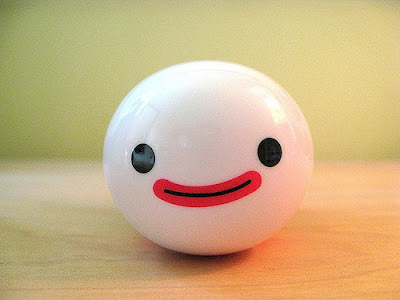 "Coffee Break Survey: Executive Toys 2010"
Customer and fellow blogger Lynette Chiang kindly references our humble little toy shop in her latest post on the Fast Company website. Interestingly, my dad got me a subscription to Fast Company several years ago when we started Tenacious Toys. Now we're IN Fast Company and Dad is very proud! Argonaut Resins announces their latest release: these neon pink Tuttzs which will be for sale at Big Kev's Geek Stuff booth #428. 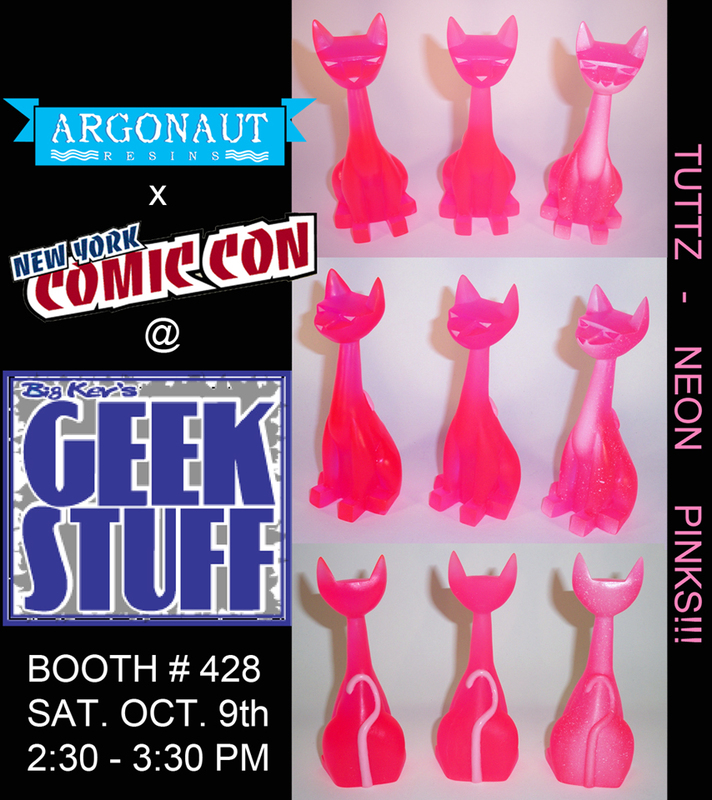 Eric from Argonaut will be signing his Tuttz resins, books and Tshirts Sat. Oct. 9th from 2:30 - 3:30 at the New York Comic Con and will also have a few other surprises on hand. The Neon Pink Tuttz will be limited to only 6 pieces and one per customer. One of the excellent AW177 customs that will be on display at the Tenacious Toys NYCC Booth #2878 next weekend!